Soraa, the world leader in GaN on GaN™ LED technology, announced today that it has extended its line of PAR and AR111 lamps to offer a full range of halogen replacement lamps from 50W to 120W halogen equivalent. The newly launched 12.5W line features a lower wattage addition to its award winning, full visible spectrum PAR30 and AR111 LED lamps, while maintaining the high Center Beam Candle Power (CBCP) characteristic of Soraa’s lamps. 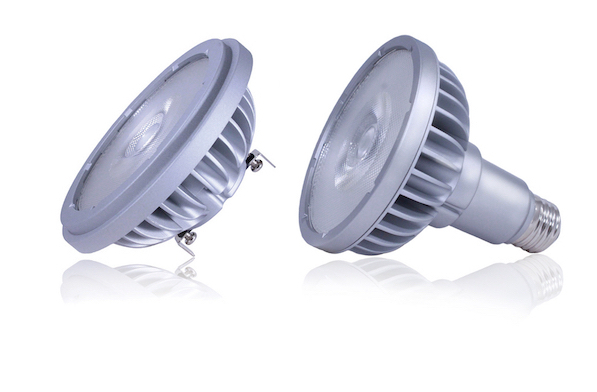 Featuring the world’s most efficient LED—Soraa’s third generation GaN on GaN™ LED—the company’s new 12.5W PAR30 lamps are the perfect lighting solution for 75W to 120W equivalent lighting applications in retail, hospitality and museum environments; while the 12.5W AR111 lamps offer an efficient choice for retail applications. Soraa’s POINT SOURCE OPTICS technology produces beautiful, high intensity and uniform beams. The optics technology enables the offering of an 8 degree narrow spot version with a CBCP of 20,000Cd—twice the CBCP from other LED manufacturers. Soraa’s PAR30 and AR111 lamps are available in 50W to 100W (Soraa 95CRI VIVID) and 60W to 120W (Soraa 80CRI BRILLIANT) halogen equivalent light output; 8 degree, 9 degree, 25 degree, 36 degree, 50 degree, and 60 degree; as well as 2700K, 3000K, 4000K, and 5000K color temperatures. Both lamps are highly compatible with a broad range of enclosed, non-ventilated, indoor and outdoor fixtures. Additionally, Soraa's 8 degree lamps work with its award-winning magnetic accessory SNAP System. With a simple magnetic accessory attachment, beam shapes can be altered and color temperature can be modified, allowing endless design and display possibilities.